You might think I'm not the type corny enough to sing "Summer Nights," (er, from Grease, young friends) you'd be wrong. All I need is someone to harmonize with and a whole bunch of friends to sing the "Tell me more, tell me more" part. I don't even need alcohol to pull through. Ahem. Anyway, this meal is a few months old. But don't worry, we ate it that day. I haven't been feeling putting it up because I am such a photography idiot and for some reason, the potato salad, which I should have focused and found a way to present well, doesn't look like the star in this picture. I was probably not thinking very clearly that day. So, I didn't have the appetite to post the picture until now, when food posts are very scarce due to my self-imposed diet. Don't worry, though: my brother's birthday is on Monday and I have planned a cake that has not made its way into the interwebs yet. Ooh! I'm so excited! A net-virgin cake! (Actually, there is only one mention of it on the internet, and it's on a review of the book I took it from. There's not even a picture.) Thanks for sticking around, though. Sadly for my diet, checking out my blog's statistics? The desserts are the most-visited items on my blog (except for the Honeycomb Canneloni-- and how could it not, frankly-- but even that's not on top). The only way this can work out for me is if my desserts magically have no fat and sugar in them. But, dear reader, I want to be sure each recipe I post at least tastes good, har har. This is from a pleasant Sunday lunch I prepared last November. 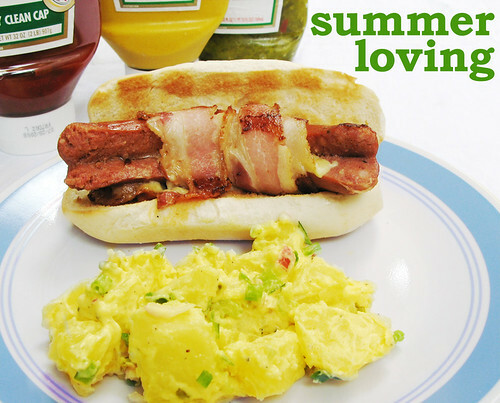 There is really nothing like a hotdog (er, Schublig) stuffed with cheese and wrapped with bacon, balanced with a refreshingly tart potato salad. My mom says it is the best potato salad she's ever tasted (I agree). The secret? Positive thinking! No, it's celery. In a large saucepan, cover the potato cubes with water. Bring to a boil over medium-high heat, add 1 tablespoon salt, reduce heat to medium, and simmer, stirring occasionally, until potatoes are tender (about 8 minutes). Drain them and toss gently in a large bowl with vinegar; let stand 20 minutes. Meanwhile, stir together the remaining ingredients (except the eggs, if using) in a small bowl. Toss the potatoes (and eggs) in the dressing gently using a rubber spatula. Cover with plastic wrap and refrigerate until chilled (about 1 hour). Can be covered and refrigerated for up to a day.